The Institute of Hydrometeorology of Albania (IHMA) was founded in 1962 under the Academy of Sciences, replacing the Hydrometeorological Service that had been created in 1949. Collection, processing and management of all meteorological and hydrological data. Studies and reports on national, regional and basin scale on time-space climatological and hydrological characteristics and water resources assessment. meteorology, climatology, weather forecasting, agrometeorology and air quality control. 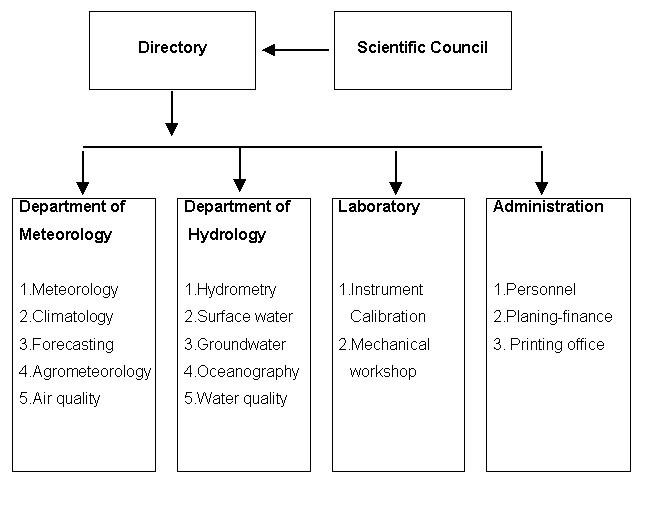 In the Department of hydrology there are also five sections: hydrometry, surface water, gruondwater, oceanography, water quality control. Besides there is the Laboratory of Calibration of Instruments and the Printing Office. An administrative staff deals mainly with personnel and planning-financial problems A Scientific Council, composed by scientifically qualified members, defines the main directions of the researching activity of the Institute. Main stations, which are generally equipped with water level recorders. In these stations are carried out the observations and measurements on water level and discharge, water temperature , suspended sediment and water quality. Hydrometric posts, where usually the observations on water level and discharge are performed. In 1989 the National Hydrological Network (NHM) was composed by 207 stations, from which 159 in rivers (35 with recorders), 10 stations in lakes (6 with recorders), 32 stations in springs and irrigation channels and 6 stations in seacoast and lagoons (all with recorders). After 1990 the NHN was seriously damaged. The number of the stations was reduced and the quality of all hydrometric activity has been affected. Even the quantity and the quality of the observations and discharge measurements was affected due to the damage of the water level recorders, uncalibrated current meters, lack of cable ways and bridges, etc. Currently the NHN consists of 103 stations. From which 92 in rivers (two of them equipped with DCP), springs and channels , 6 stations in seacoast and lagoons and 5 in lakes. At present, the IHMA keeps control on the actions from its centre in Tirana, but for the field activities linked to hydrometry (collection of water level data, discharge measurements etc.) the tasks are distributed among 8 regional centres. included. In this network, 27 stations in rivers are defined as main stations and will be equipped with water level recorders, as well as 5 stations in seacoast and lagoons and 1 stations in the lakes. Also 500-600 discharge measurements each year (or 8-10 measurements for each station) will be performed in all the stations of the network. In 75% of the stations the discharge measurement will be done from the bridges, in 15% of them by foot and in 8 stations by means of the cableways or boats. Traditionally, the river discharge in Albania are measured by the method of flow velocities, using current meters. Out of the measurements a rating curve linking the discharge to the water level at the gauge is established, and updated if some changes in the river cross-section or profile occurs. The rating curve is considered as valid for the range of discharges that have been measured; it is then extrapolated for higher flows by the Chezy formula. The most difficult problem in the activities of the IHM remains the measurement of flow velocity in rivers, because of the outdated equipment and because in the mountainous torrents the measurement of the discharge through flow velocities can be inappropriate. Taking into account the experience in other countries, and the fact that more than 65% of the stations in Albania are located in mountainous areas, the intention is to start with the use of so-called dilution method. The use of this method of flow velocity measurement firstly will improve the accuracy of the discharge measurement and secondly it will make possible to measure the discharge even at high water levels. Furthermore, this method could reduce the cost of the discharge measurement. 1. "MEDIMONT-PECO - A multidisciplinary and multinational study on the desertification of the Mediterranean mountains"-1995, financed by EC. The main objectives of this project was to study the natural process of desertification related to the manmade degradation in the Mediterranean mountains by means of desertification indexes, the relation between natural and human influence and the measures for their rehabilitation. 2. "EUROSLOPE-PECO - A study of sediment transport in mountainous rivers"-1995, financed by EC. The main objective of the project was to compare the different methods of the measurement and the computation of the sediment transport in the rivers with high catchment slopes. 3. "National Water Strategy of Albania" -1996, financed by EC. 4. "MED-POLL - The pollution of the Mediterranean sea", financed by EC. The main objective of the project was to establish a monitoring network supported by all Mediterranean countries in order to collect data on seawater quality and especially on the pollution of water by the industry, agriculture, urban areas etc. 5. "MED-HYCOS - Mediterranean Observation System of the Hydrological Cycle", financed by WB through WMO and co-ordinated by Pilot Regional Centre in Montpellier. The main objective of the programme is the implementation of an information system on water in the Mediterranean region. 6. "Natural Resources of Albania", financed by the Albanian Government. The main objective of the project in the field of hydrology is the assessment of national water resources and the definition of a framework for integrated and sustainable water management. 5. The Climatic and Hydrological Characteristics of the Western Plain of Albania . (monograph). 7. 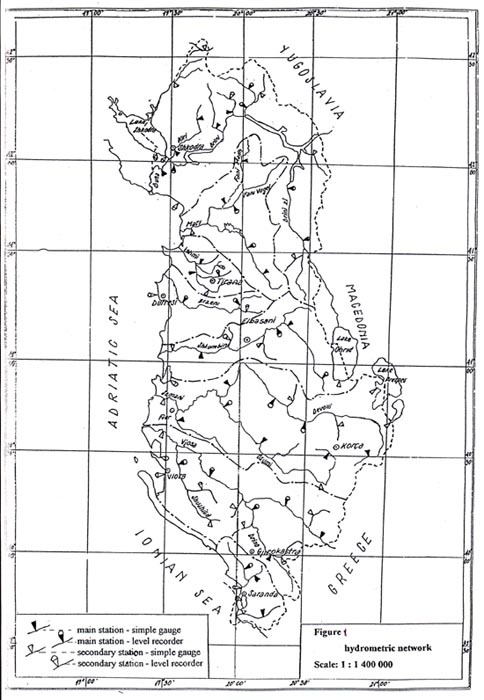 Hydrology of the main rivers of Albania for the National Hydroenergitic Scheme.